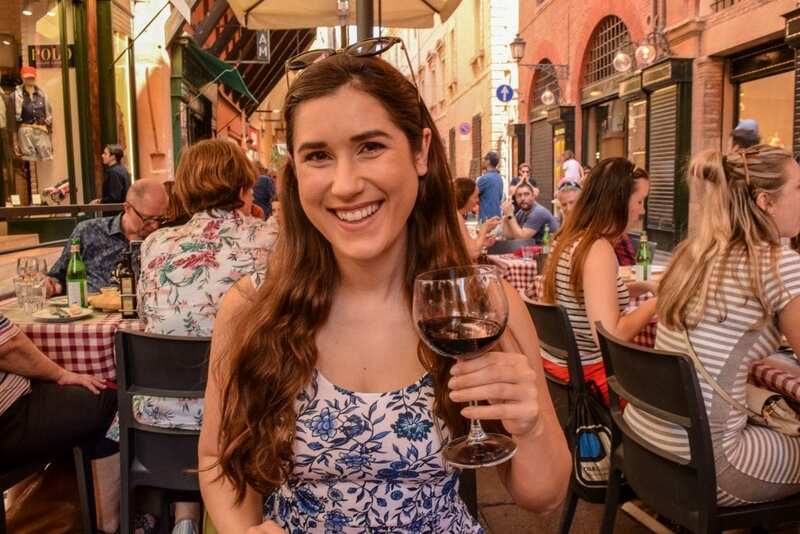 Traveling from Florence to Bologna by train is an incredibly enjoyable experience: it’s fairly simple to execute, affordable, and doesn’t take long. Whether you’re heading to Bologna to catch a flight or to take a day trip to Bologna from Florence, here’s how to make your train journey smooth! How Much Does it Cost to Take the Train From Florence to Bologna? How Long Does it Take to Travel from Florence to Bologna By Train? Trying to Get to the Bologna Airport? Prices vary, but generally, you’ll spend around 10 Euros to travel each direction between Florence and Bologna by regional train. If you book a fast train, prices can increase dramatically. On the regional (aka “slow”) train, expect to spend between 1.5 and 2 hours traveling in each direction. These tickets are generally inexpensive and easy to get–you don’t need to book far in advance–and there are plenty of times to choose from each day. On the express or fast train, you can travel from Florence to Bologna and vice versa in well under an hour each way, but tickets are significantly more expensive if you book at the last minute. Ideally, you’ll want to buy a ticket from the Santa Maria Novella Train Station in Florence to the Bologna Centrale Station in Bologna. Most searches will automatically assume this, but sometimes more suburban stations that are located further away from the center of the cities come up as options. There are train companies that run routes between Florence and Bologna, and when booking your train trip to Bologna from Florence, you’ll need to choose which one to use. Trenitalia is Italy’s national company and offers several routes between Bologna and Florence each day. You’ll see them marked as “Trenitalia” for regional trains. “Frecce” trains (aka “Frecciarosa”, “Frecciabianca”, etc) are the fast trains. They are run by the same company, but take less time and generally cost more. Italo Train is a private company that also runs some trains between Bologna and Florence. We’ve generally found their prices higher and have always ended up booking with Trenitalia for this route, but you can compare the cost of both before booking. If you’re planning to take a regional/slow train, you can purchase your train ticket to Bologna from Florence at any time, even the day of travel, without a problem. If you’re planning on taking a fast train, you’ll save significant amounts of money by booking as far in advance as possible. If you don’t purchase your ticket on a phone app and/or don’t have an electronic ticket to show, you must validate your ticket before boarding the train to travel from Florence to Bologna. If you don’t, you can easily be fined a large amount or even be kicked off the train. 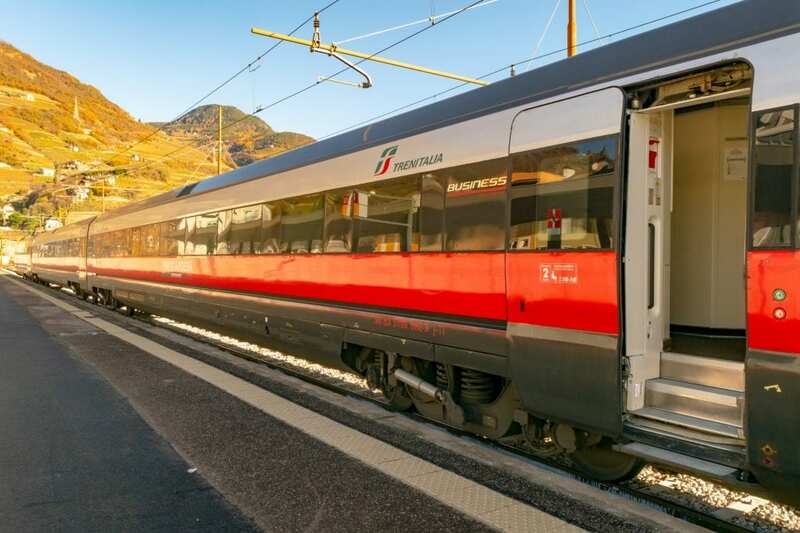 If you don’t want to worry about it, electronic tickets are an easy workaround: when we travel from Florence to Bologna by train, we generally purchase tickets on the Trenitalia app and have the conductor scan our tickets on our phone. Once you’ve bought your train ticket from Florence to Bologna and have boarded, you have nothing else to worry about! Simply sit back, relax, and enjoy watching the Tuscan and Emilia-Romagnan countryside go by while you dream about the tagliatelle al ragu you’ll undoubtedly be digging into in the near future. 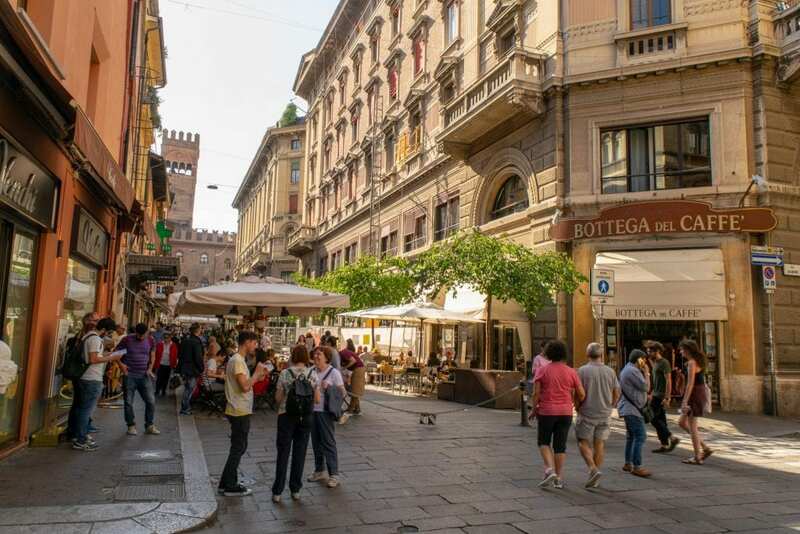 Piazza Maggiore, Bologna’s main piazza and the perfect place to start your visit, is an easy 20-minute walk down Via Galliera from Bologna Centrale. 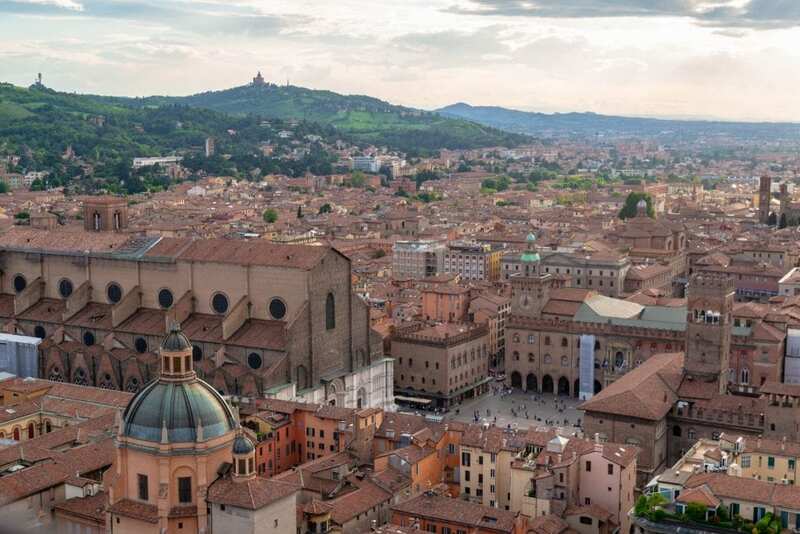 If you’re not carrying any heavy bags and aren’t limited in mobility, don’t worry about any other form of transportation when you arrive in Bologna–simply start walking and enjoy the increasingly beautiful scenery! 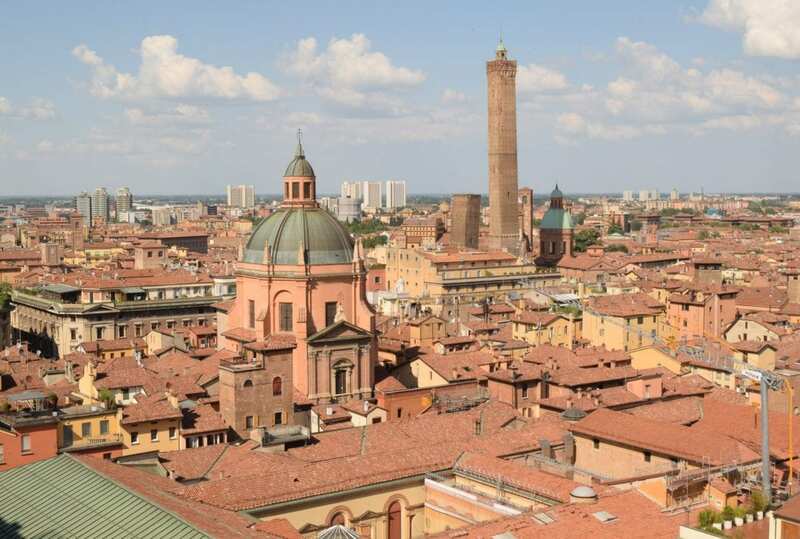 Visiting Bologna on a day trip from Florence? We’ve written an entire guide to spending one day in Bologna, but here are a couple of very quick highlights you can look forward to. 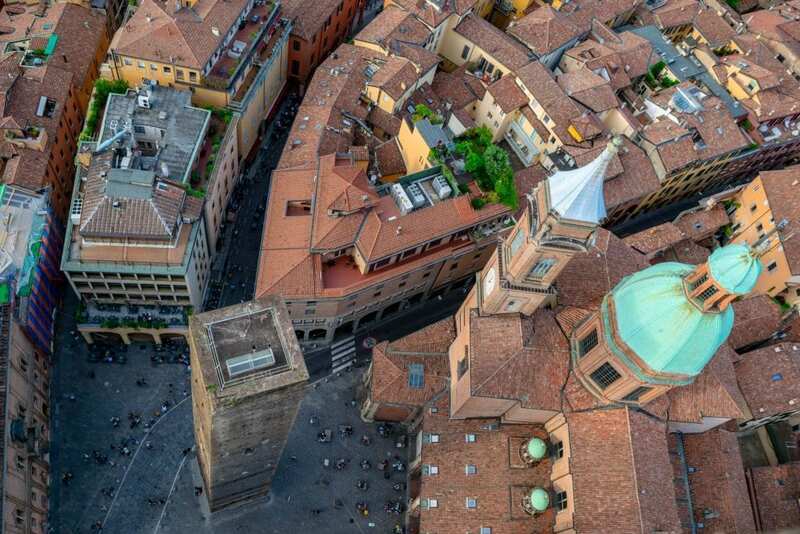 Move over, Pisa: Torre Asinelli is not only a taller leaning tower than what you’ll find in Pisa, it’s hard to imagine a cooler view than what you’ll find at the top! Checking out Via Drapperie & the Quadrilatero area. Want to wander beautiful streets while eating and photographing delicious things? This is the area of Bologna for you. 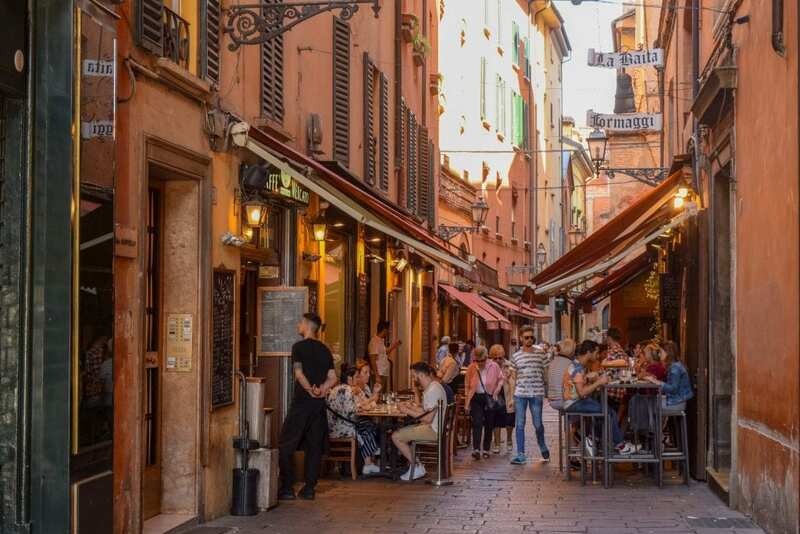 If there’s one thing Bologna is known for, it’s its food: come hungry and prepare to inhale copious amounts of tagliatelle al ragu, parmigiano reggiano, traditional balsamic vinegar, tortellini en brodo, and more! 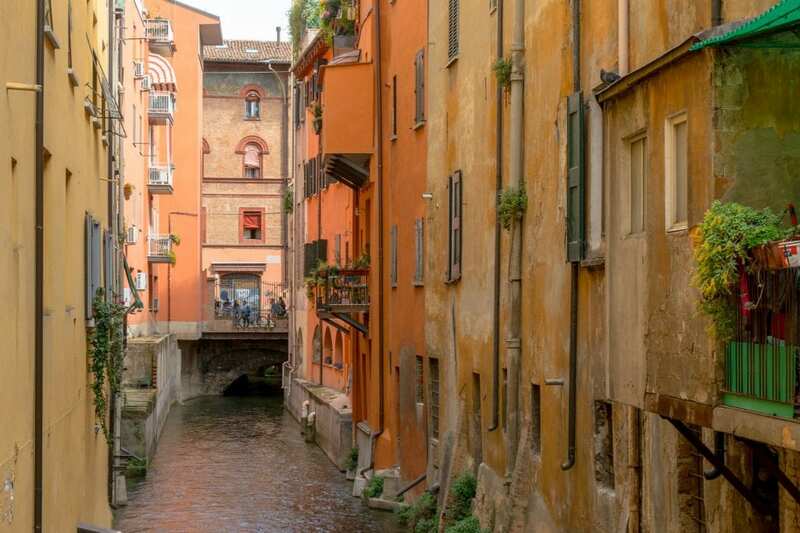 Seeking out Bologna’s hidden canals. Bologna’s canals date back to the Middle Ages, and while they take a little effort to track down these days, they’re worth it! Trying to reach the Bologna Airport to catch a flight as soon as you get to the city? Directly in front of Bologna Centrale you’ll find the airport shuttle. Service runs every 11 minutes, year-round, and you can buy tickets online or at the kiosks at the bus stop (just beware the scammers in front who often want to “help” you buy tickets).